Despite Ella Jesmajian’s small stature and timid appearance, strong vocal chords fill the Quinnipiac sophomore with a huge talent. Jesmajian, also known by her stage name Ella Berkeley, grew up listening to a variety of music in New York. By the time she was 11, Jesmajian’s parents realized that their daughter’s voice was special. Growing up with musically inclined parents who loved listening to blues and jazz, it is no surprise that Jesmajian shares the same passion. The sultry sounds of Jesmajian’s music make it easy to understand why artists such as Ray Charles and Joss Stone have influenced her. “Ray Charles is a classic, and I love his music, and Joss Stone is someone who is more modern and I can relate to her musically,” Jesmajian said. By the time she was 12, Jesmajian began to embrace her talent by practicing with karaoke machines. At 13, she entered into the American Teen Idol competition in New York. She placed in the top 25. About five years ago, Jesmajian recorded her first demo. This past summer she recorded new music in New York City and is in the process of signing with the American Society of Composers, Authors and Publishers. Since then, she has been working hard to promote her album through word of mouth and the Internet. Jesmajian met Lauren Shevit, during her sophomore year of high school. Now both Quinnipiac sophomores, Shevit strongly supports her friend’s talent. Although Shevit has yet to hear her friend’s demo, she plans to listen soon. Jesmajian says her main goal is to familiarize students and the public with her work, and ultimately build a substantial fan base. “It’s hard to get a record deal when labels go and look at your Facebook page and you only have a handful of people who have liked the page,” Jesmajian said. One of Jesmajian’s favorite singles is the first song she wrote on her own, “Can’t Take the Light (Shadows Have Fallen).” In the past, Jesmajian received musical assistance from her mother, who also sings and writes music. According to Jesmajian, her writing is inspired mostly by her mood and the surrounding atmosphere. “Sometimes I can write a song in 10 minutes, sometimes it takes me three years,” Jesmajian said. While the idea of being signed to a record label is a dream come true for many aspiring vocalists, Jesmajian remains grounded and focused on her academics. 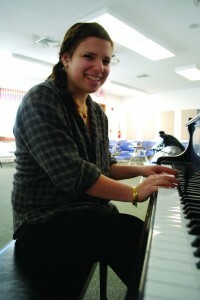 Jesmajian is a member of the Pi Beta Phi sorority and a criminal justice major. 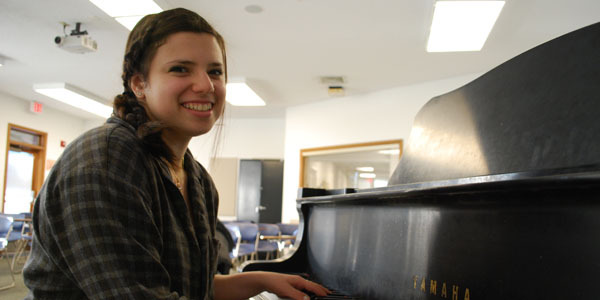 Jesmajian realistically foresees law school and possibly an FBI career in her future, yet her passion for her budding music career remains positive. You can listen to Ella Jesmajian’s music at www.purevolume.com/ellaberkeley.